Lil' Yachty surprised his fans at Yachty's Pizzeria yesterday in New York City. 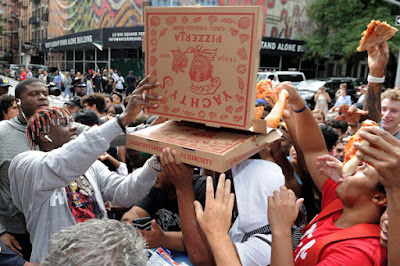 Ahead of his appearance at the MTV VMA's, the Atlanta-born artist enjoyed a slice and mingled with throngs of fans waiting in line for his two day pop-up experience that took over Famous Ben's Pizzeria in Soho. The pop-up, presented in partnership with Bravado, offers six limited-edition styles, including a short sleeve tee for $30, long sleeve tee for $40, hoodie for $60, satin bomber jacket for $100, hat for $30, and a refrigerator magnet for $5. The pop-up and collection is presented in partnership with Bravado, UMG's leading merchandise and brand management company.